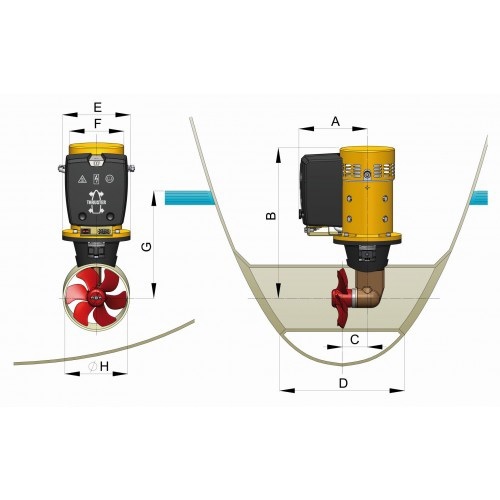 WHAT IS THE PURPOSE OF A BOW THRUSTER ? When manoeuvring a boat, at low speed, the required control of the movements of the boat, especially those of the bow, is extremely difficult to achieve. In such cases, a bow thruster is the solution to the problem. Even when the boat is not under way, complete control of the movements of the ship's bow can be achieved by operating the bow thruster. VETUS uses plastic propellers, which cannot corrode. Owing to their low weight, the maximum thrust force is obtained very quickly and with minimum use of energy. The propeller blades are shaped in such a way, that the thrust is equal in either direction. The are also designed with a special view to being used inside a tunnel, thus avoiding cavitation (= unwanted noise!). The smaller the diameter of the tunnel, the less resistance it will cause when under way. In addition, a smaller diameter also allows the tunnel to be installed further forward which enhances the turning moment of the boat. VETUS has obtained the optimum compromise between high efficiency of the bow thruster and low resistance when the boat is under way. For vessels made of steel, aluminium and g.r.p., VETUS offers steel, aluminium or g.r.p. tunnels. Application of a streamlined tail piece by VETUS not only ensures a better efficiency through lower resistance but also a lower noise level. Disturbance of the free flow of water through the tunnel, caused by a non-streamlined tail piece, results in cavitation or, in other words, unwanted noise! In order to protect the bronze tail piece against corrosion by electrolysis, a zinc anode (fitted or separate) is standard with each VETUS bow thruster. The transmission inside the tail piece uses bevel gears, which produce far less noise than chain transmission. In order to ensure the highest possible efficiency and longevity, VETUS has specified electric motors, which are constructed for use as bow thruster motors. In contrast with modified starter motors, these VETUS motors allow continuous running for several minutes. The motor of the VETUS bow thruster may be installed in any position i.e. horizontally as well as vertically. Yet make sure that the motor is positioned above the propeller at all times. WHICH FACTORS WILL AFFECT THE THRUST EFFICIENCY ? � low voltage at the motor, due to reduced battery voltage or excessive voltage drop through the battery (main supply) cables. � when the tunnel/hull connection is not made in the best possible way; in other words: the shape of the tunnel openings is a discerning factor. � when the tunnel openings are provided with grilles. All VETUS bow thrusters may also be used as a stern thruster (at the rear of the boat). This will again enhance the manoeuvring capabilities considerably. A bow thruster is an electrically or hydraulically driven laterally operating propeller, which enables the bow of a boat to move sideways. By simply operating the controls, the bow of the vessel will move to either port or starboard. In a similar manner, the stern of the boat can also be controlled, by installation of a VETUS stern thruster. It goes without saying that a VETUS bow and/or stern thruster will considerably enhance the manoeuvrability of a boat in marinas and locks, particulary when there are strong winds and currents!